In addition to global warming, carbon dioxide emissions cause another, less well-known but equally serious and worrying phenomenon: ocean acidification. Researchers in the Laboratoire d'Océanographie at Villefranche (LOV) (CNRS / UPMC) have just demonstrated that key marine organisms, such as deep-water corals and pteropods (shelled pelagic mollusks) will be profoundly affected by this phenomenon during the years to come. Two studies have been published in the journal Biogeosciences. Since 1800, one third of anthropogenic CO2 emissions has been absorbed by the oceans, corresponding to an annual uptake of one ton of CO2 per person. This massive absorption has allowed to partly mitigate climate change but it has also caused a major disruption to the chemistry of seawater. Indeed, this absorbed CO2 causes an acidification of the oceans and, at the current rate of emissions, it is estimated that their pH will fall by 0.4 units between now and 2100. This corresponds to a 3-fold increase of the mean acidity of the oceans, which is unprecedented during the past 20 million years. The LOV team, led by Jean-Pierre Gattuso, studied the impact of such a reduction in pH on calcifying organisms. Pteropods (pelagic marine mollusks) and deep-water corals, both playing essential roles in their respective ecosystems, live in areas that will be among the first to be affected by ocean acidification. The pteropod Limacina helicina thus has an important part to play in the food chain and functioning of the Arctic marine ecosystem. Its calcium carbonate shell provides vital protection. 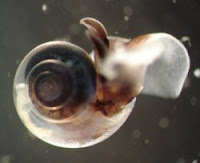 However, the LOV study has shown that the shell of this mollusk develops at a rate that is 30% slower when it is kept in seawater with the characteristics anticipated in 2100. An even more marked reduction (50%) has been measured in the cold-water coral Lophelia pertusa. While tropical coral reefs are built by a large number of species, coral communities in cold waters are constructed by one or two species but provide shelter for many others. A reduction in the growth of reef-building corals due to ocean acidification may therefore threaten the very existence of these biological structures. These first results raise major concerns about the future of pteropods, deep-water corals and the organisms that depend on them for nutrition or habitat. Research programs such as EPOCA, coordinated by CNRS, are planning new studies on other marine organisms and ecosystems. They are carrying out long-term experiments to study the combined impact of ocean acidification and other parameters that will also be modified during the decades to come, such as temperature and nutrient concentrations. Ocean acidification can only be controlled by limiting future atmospheric levels of CO2. Negotiations aimed at reducing greenhouse gas emissions (COP 15) are under way and should be finalized in Copenhagen next December. These negotiations must take account not only of increased temperature but also of the acidic nature of CO2 which, once absorbed by the oceans, will have potentially dramatic effects on numerous marine organisms and ecosystems.